Definition at line 862 of file app-layer.c. Referenced by AppLayerRegisterThreadCounters(), and AppLayerSetupCounters(). Definition at line 74 of file app-layer.c. Cleanup a packet so that we can free it. No memset needed.. Definition at line 1040 of file app-layer.c. Definition at line 957 of file app-layer.c. Includes de initializing protocol detection and the protocol parser. Definition at line 791 of file app-layer.c. References AppLayerDeSetupCounters(), AppLayerParserDeSetup(), AppLayerProtoDetectDeSetup(), SCEnter, and SCReturnInt. Definition at line 942 of file app-layer.c. tctx Pointer to the thread context to destroy. Definition at line 825 of file app-layer.c. References AppLayerThreadCtx_::alp_tctx, AppLayerThreadCtx_::alpd_tctx, AppLayerParserThreadCtxFree(), AppLayerProtoDetectDestroyCtxThread(), SCEnter, SCFree, and SCReturn. Referenced by AppLayerGetCtxThread(), DecodeThreadVarsFree(), DetectDceOpnumRegister(), DetectReplaceFreeInternal(), and StreamTcpReassembleFreeThreadCtx(). Pointer to the newly create thread context, on success; NULL, on failure. Definition at line 803 of file app-layer.c. References AppLayerThreadCtx_::alp_tctx, AppLayerThreadCtx_::alpd_tctx, AppLayerDestroyCtxThread(), AppLayerParserThreadCtxAlloc(), AppLayerProtoDetectGetCtxThread(), SCEnter, SCMalloc, and SCReturnPtr. Referenced by DecodeThreadVarsAlloc(), DetectFragBitsRegister(), DetectReplaceFreeInternal(), and StreamTcpReassembleInitThreadCtx(). Definition at line 742 of file app-layer.c. References AppLayerProtoDetectGetProtoByName(), SCEnter, and SCReturnCT. Referenced by DetectAppLayerEventRegister(), and SigMatchListSMBelongsTo(). alproto The internal protocol id. String representation of the protocol. Definition at line 749 of file app-layer.c. References AppLayerProtoDetectGetProtoName(), SCEnter, and SCReturnCT. Referenced by AppLayerListSupportedProtocols(), AppLayerParserParse(), AppLayerSetupCounters(), and DetectLuaRegister(). First run protocol detection and then when the protocol is known invoke the app layer parser. Definition at line 551 of file app-layer.c. References AppLayerThreadCtx_::alp_tctx, AppLayerThreadCtx_::alproto, Flow_::alproto, Flow_::alproto_expect, Flow_::alproto_orig, Flow_::alproto_tc, ALPROTO_TLS, Flow_::alproto_ts, ALPROTO_UNKNOWN, Packet_::app_layer_events, TcpReassemblyThreadCtx_::app_tctx, APPLAYER_NO_TLS_AFTER_STARTTLS, APPLAYER_UNEXPECTED_PROTOCOL, AppLayerDecoderEventsSetEventRaw(), AppLayerParserParse(), AppLayerProtoDetectReset(), AppProtoToString(), DEBUG_ASSERT_FLOW_LOCKED, TcpSession_::flags, FlowChangeProto(), PACKET_PROFILING_APP_END, PACKET_PROFILING_APP_START, PrintRawDataFp(), SCEnter, SCLogDebug, SCReturnInt, STREAM_GAP, STREAM_START, STREAM_TOCLIENT, STREAM_TOSERVER, STREAMTCP_FLAG_APP_LAYER_DISABLED, and StreamTcpSetStreamFlagAppProtoDetectionCompleted. Referenced by StreamNeedsReassembly(), and StreamTcpReassembleAppLayer(). Handle a app layer UDP message. If the protocol is yet unknown, the proto detection code is run first. Definition at line 671 of file app-layer.c. 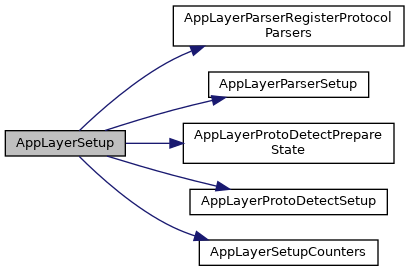 References AppLayerThreadCtx_::alp_tctx, AppLayerThreadCtx_::alpd_tctx, Flow_::alproto, ALPROTO_FAILED, ALPROTO_UNKNOWN, AppLayerParserParse(), AppLayerProtoDetectGetProto(), FLOW_PKT_TOSERVER, Packet_::flowflags, FlowSwap(), PACKET_PROFILING_APP_END, PACKET_PROFILING_APP_PD_END, PACKET_PROFILING_APP_PD_START, PACKET_PROFILING_APP_START, PACKET_PROFILING_APP_STORE, PacketSwap(), Packet_::payload, Packet_::payload_len, SCEnter, SCLogDebug, SCReturnInt, STREAM_TOCLIENT, STREAM_TOSERVER, and SWAP_FLAGS. Definition at line 113 of file app-layer.c. References AppLayerThreadCtx_::alp_tctx, AppLayerThreadCtx_::alpd_tctx, AppLayerThreadCtx_::alproto, Flow_::alproto, ALPROTO_FAILED, Flow_::alproto_tc, Flow_::alproto_ts, ALPROTO_UNKNOWN, APP_LAYER_DATA_ALREADY_SENT_TO_APP_LAYER, Packet_::app_layer_events, APPLAYER_DETECT_PROTOCOL_ONLY_ONE_DIRECTION, APPLAYER_MISMATCH_PROTOCOL_BOTH_DIRECTIONS, APPLAYER_PROTO_DETECTION_SKIPPED, APPLAYER_WRONG_DIRECTION_FIRST_DATA, AppLayerDecoderEventsSetEventRaw(), AppLayerParserGetFirstDataDir(), AppLayerParserGetStreamDepth(), AppLayerParserParse(), AppLayerProtoDetectGetProto(), AppProtoToString(), BUG_ON, TcpSession_::client, AppLayerCounters_::counter_tx_id, TcpSession_::data_first_seen_dir, EngineModeIsIPS(), TcpStream_::flags, flags, TcpSession_::flags, Flow_::flags, Packet_::flags, FLOW_IS_PM_DONE, FLOW_IS_PP_DONE, FLOW_PKT_TOCLIENT, FLOW_PKT_TOSERVER, FLOW_PROTO_DETECT_TC_DONE, FLOW_PROTO_DETECT_TS_DONE, FLOW_RESET_PE_DONE, FLOW_RESET_PM_DONE, FLOW_RESET_PP_DONE, FlowCleanupAppLayer(), Packet_::flowflags, FlowSwap(), TcpStream_::isn, TcpStream_::last_ack, likely, PACKET_PROFILING_APP_END, PACKET_PROFILING_APP_PD_END, PACKET_PROFILING_APP_PD_START, PACKET_PROFILING_APP_START, PacketSwap(), Packet_::pcap_cnt, PKT_PROTO_DETECT_TC_DONE, PKT_PROTO_DETECT_TS_DONE, PrintRawDataFp(), Flow_::proto, Flow_::protoctx, Flow_::protomap, SCLogDebug, TcpSession_::server, StatsAddUI64(), STREAM_TOCLIENT, STREAM_TOSERVER, STREAMTCP_FLAG_MIDSTREAM, STREAMTCP_FLAG_MIDSTREAM_SYNACK, STREAMTCP_STREAM_FLAG_GAP, STREAMTCP_STREAM_FLAG_NOREASSEMBLY, StreamTcpDisableAppLayer(), StreamTcpInlineMode(), StreamTcpReassembleAppLayer(), StreamTcpResetStreamFlagAppProtoDetectionCompleted, StreamTcpSetStreamFlagAppProtoDetectionCompleted, SWAP_FLAGS, TcpSessionSetReassemblyDepth(), UPDATE_DIR_OPPOSING, and UPDATE_DIR_PACKET. Definition at line 756 of file app-layer.c. References AppLayerThreadCtx_::alproto, ALPROTO_MAX, AppLayerGetProtoName(), AppLayerProtoDetectSupportedAppProtocols(), SCEnter, and SCReturn. Definition at line 841 of file app-layer.c. Definition at line 846 of file app-layer.c. Definition at line 853 of file app-layer.c. 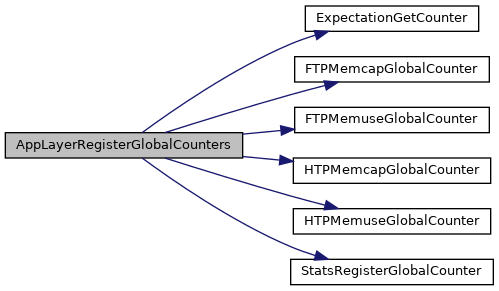 References ExpectationGetCounter(), FTPMemcapGlobalCounter(), FTPMemuseGlobalCounter(), HTPMemcapGlobalCounter(), HTPMemuseGlobalCounter(), and StatsRegisterGlobalCounter(). Definition at line 913 of file app-layer.c. References AppLayerThreadCtx_::alproto, ALPROTO_FAILED, ALPROTO_MAX, AppLayerParserProtocolIsTxAware(), AppLayerProtoDetectSupportedAppProtocols(), AppLayerCounters_::counter_id, AppLayerCounters_::counter_tx_id, FlowGetProtoMapping(), IPPROTOS_MAX, and StatsRegisterCounter(). Includes protocol detection setup and the protocol parser setup. Definition at line 776 of file app-layer.c. References AppLayerParserRegisterProtocolParsers(), AppLayerParserSetup(), AppLayerProtoDetectPrepareState(), AppLayerProtoDetectSetup(), AppLayerSetupCounters(), SCEnter, and SCReturnInt. Referenced by ListAppLayerProtocols(), ListKeywords(), PostRunDeinit(), and RunUnittests(). Definition at line 863 of file app-layer.c. References AppLayerThreadCtx_::alproto, ALPROTO_FAILED, ALPROTO_MAX, AppLayerGetProtoName(), AppLayerParserProtocolIsTxAware(), AppLayerParserProtoIsRegistered(), AppLayerProtoDetectSupportedAppProtocols(), FlowGetProtoMapping(), IPPROTOS_MAX, and str. Definition at line 2610 of file app-layer.c. References SCEnter, SCReturn, and UtRegisterTest(). Definition at line 86 of file app-layer.c. Definition at line 88 of file app-layer.c.